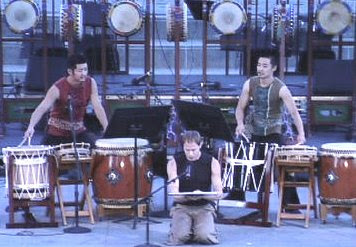 Byron Au Yong has worked with the leading taiko performers in Japan and North America. His compositions have been performed by Kaho Tosha (Forbidden Circles) and are recorded by On Ensemble (Dust and Sand) and Portland Taiko (Rhythms of Change). Additionally, Au Yong has served as music consultant for TAIKOPROJECT as well as workshop leader for North American Taiko Conferences and Regional Taiko Gatherings in Los Angeles, Palo Alto, Portland, and Seattle. Awards from the American Composers Forum, Creative Capital and Meet the Composer acknowledge the unique and effective ways Byron composes work. He brings training in Western classical and Asian traditional music to help discover ways for taiko groups to develop existing and new repertoire. Byron provides the outside ears necessary for artistic directors and musicians. He offers feedback from multiple perspectives informed by his experience as a performer, teacher and composer. Teaching Rhythmic Fundamentals and Listening to Music in the Dance Department at Cornish College of the Arts has allowed Byron to refine his workshop methods for musicians who move as well as dancers who play drums. Au Yong, Byron. Imagining a Future for Taiko. September 2012. Au Yong, Byron and Chad Williams. New Music for Taiko. Video, August 2011. Au Yong, Byron. The Eight Biennial North American Taiko Conference. NewMusicBox, August 2011.